Contrary to their name, the Australian Shepherd is originally from the United States. This local breed was used for herding livestock and working long days in the fields. They would do whatever job that needed to be done. Their alertness and loyalty give them guarding instincts which make them great watchdogs for family households. Among one of the smartest breeds of dogs, the Australian Shepherd was praised for their impressive intelligence. They even debuted in several performances and films during the 1950’s which increased their popularity in the United States. Today, this breed is widely loved for their compassionate spirit and willingness to learn. Australian Shepherds can quickly become bored, which can lead to destruction of household items or excessive barking. As long as you train these dogs at an early age and give them plenty of attention, they can easily turn into the well-mannered and disciplined pets you have always wanted. Their intelligence and agility make them skilled at any sport. They were bred to take direction, which makes them easily trainable. Just like with most dogs, positive reinforcement is the best way to encourage good behavior. To ensure a high developed skill set in your Australian Shepherd, start the training process at an early age. These athletic dogs need plenty of exercise to keep them entertained. A simple walk around the block won’t be enough; this breed needs to be moving in any way possible.They also do very well in speed and agility competitions due to their sharp minds and quick speed. Running, walking, swimming, and fetching are all favorite activities for the Australian Shepherds and will mentally stimulate their brains on a regular basis. An Australian Shepherd’s lifespan is anywhere from 12-15 years. This estimation is the same for dogs of similar size. Is the Australian Shepherd a Popular Breed? Because of their high intelligence and pleasant demeanor, the Australian shepherd is a popular breed across the entire United States. According to the American Kennel Club, this breed has a high ranking of 16th place for being one of the most popular dog types. The amount of food that your dog needs depends on their age and level of activity. For a more specific feeding plan, consult with your veterinarian on their recommendations. Always remember to have a bowl of fresh water available. The Australian Shepherd has a thick and beautiful coat that needs to be brushed regularly. A slicker brush and undercoat rake work best to remove shedded and dead hair. They should also be bathed occasionally to prevent mats. When you are grooming your pet, be sure to check for any sores, rashes, or irritated skin that may be the result of an infection. 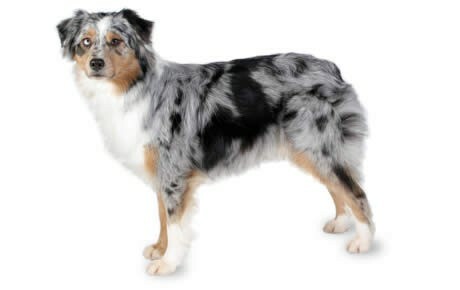 A shiny coat is a clear indication of a healthy Australian Shepherd. Make sure to also check their ears and trim their nails at least once a month. Are Australian Shepherds Good With Children? As long as your Australian Shepherd is trained to be with children at a young age, there should be no conflict. However, since they come from a herding breed, nipping or chasing can be a common problem, especially with small children. When trained properly, the Australian Shepherd is a loving breed that works great in families. Hip dysplasia: This occurs when there is a deformation within the hip socket which leads to pain or lameness. Hip dysplasia requires surgical correction in severe cases. Eye issues: Colobomas occurs when part of the structure in the eye is missing. It can be inherited and in severe cases, may lead to blindness. Other eye issues to be aware of include cataracts, progressive retinal atrophy (PTA), and detached retinas, persistent pupillary membrane, and Colly eye Anomaly. Multiple drug sensitivity: An Australian Shepherd may be sensitive to antibiotics, parasite control medications, or pain medicines. This can be deadly if your dog is diagnosed with another illness that requires medication for treatment. Epilepsy: This is a neurological disorder that causes seizures in dogs. Epilepsy can be caused by trauma, toxins, brain tumors, or other internal factors. Allergies: Environmental factors can cause allergies for Australian Shepherds. This causes itchy and dry skin and can lead to a bacterial infection if gone untreated. Hypothyroidism: 8% of Australian Shepherds are diagnosed with hypothyroidism. This disease occurs when there is an insufficient amount of thyroid hormones being produced. This can easily be treated through synthetic hormone pills. Our amazing Roma has been seizure free for almost 2 years thanks to the Cannapet biscuits. We recommend your products to everyone. Thank you Canna-Pet! When we brought her to the vet in June 2018, he instantly recommended Canna-Pet products to help her calm down. We started her almost 30 days ago and the results were amazing. This is a different dog and she looks forward to her dosages in the morning and night. The effect on our dog was unimaginable. When she started to have them more frequently I decided to try canna pet. She now goes from 10-13 days with a seizure. A big change from every 4-5 days. Though I wish the distance between each get seizure was longer , I am grateful that something is working better than all others that we have tried. Putting Jax on Canna Pet, has been one of the best decisions I have made for him. He is a much happier dog. We never come home to accidents in the house anymore, things destroyed, or items knocked off the counters or tables. I would like to say that we are very pleased with the results of the Canna-Pet treats. Autumn has a rear leg injury that limits her playtime. When she comes inside she receives the relief she needs. Thanks to Canna-pet he is not having severe seizures every month. We have worried that a bad one could change his personality or worse.